The Golden Eagle Trust in collaboration with the National Parks and Wildlife Service of the Department of the Environment and several individuals propose to reintroduce White-tailed Sea Eagles to Ireland using well-established methodology. A thorough evaluation of the project in the context of the species’ global range, status, and threats, was completed in 2006, including population modeling to determine the likelihood of success and the number of individuals needed to establishing a viable self-sustaining population. Further, the suitability of Killarney and the coastal environment in Kerry for the species was assessed and endorsed by leading Norwegian sea eagle experts. Southwest Ireland was identified as being the most suitable area for reintroduction and the long- term prospects of population reestablishment. After careful site selection, Killarney National Park, County Kerry, was chosen as the release site likely to give the reintroduction the best chance of success. In summary, the project meets the International Union for Conservation of Nature and Natural Resources (IUCN) criteria governing such programmes, and will fulfill part of the Republic of Ireland’s obligation to halt and restore biodiversity losses where appropriate. Reintroducing sea eagles to Ireland promises to be one of the most challenging and exciting conservation projects ever undertaken. 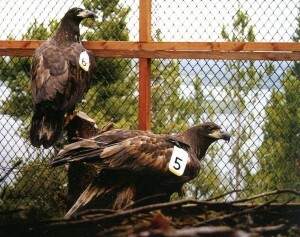 As Sea Eagles take some 5-6 years to mature and breed we expect the first breeding attempts by 2012-2013. Because these birds, like other large, long-lived birds such as albatrosses and penguins, have very low breeding rates (see Breeding), establishing a viable population is dependent on low adult mortality. Ultimately, the long-term success of this programme will depend on the goodwill and support of the people of Kerry and West Cork, especially the farming and fishing communities of the Dingle, Iveragh, and Beara peninsulas, where most Sea Eagles are likely to settle to breed. The Golden Eagle Trust, in collaboration with its partners, will endeavor to work with these communities and others to make the project a success. The white-tailed sea eagles nest in Ireland for the first time in over 100 years. The Irish white-tailed sea eagle was driven to extinction in the early 20th century. But thanks to the White-Tailed Sea Eagle Reintroduction Project the eagles face a new spring in Ireland with the first documented nesting attempt in more than a century. They were released in Killarney National Park in 2008 and 2009, respectively. Last year they each found their way to Co. Clare and paired up, and this spring they nested on a small island on Lough Derg, one of Ireland’s biggest lakes, close to the village of Mountshannon. 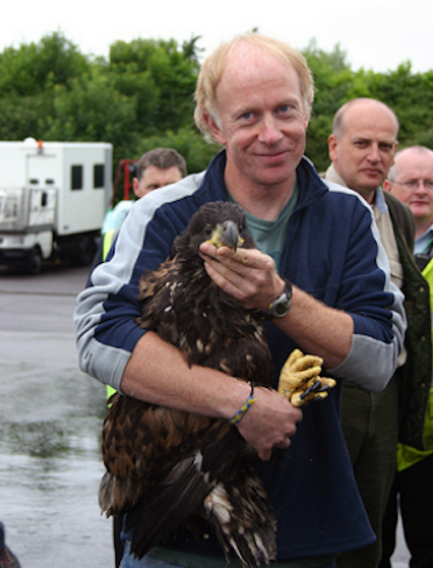 “This is a truly momentous event,” says Dr. Allan Mee, project manager for the Golden Eagle Trust. “Seeing them nesting in the wild in Ireland is the day we have all been waiting for”. First-time breeders lack experience, and breeding success depends on getting everything right. But Dr. Mee is impressed by the young couple. He says that once the birds settled down to incubate the clutch of eggs both parents were very diligent. The nest has only very rarely been left unattended and birds have been quick to spot potential dangers such as the presence of hooded crows which might predate the eggs. “Since the eggs take some six weeks to hatch they still have a long way to go. But so far so good,” says Mee. And according to Dr. Duncan Halley, the eagles have chosen a good spot for their first attempt. White-tailed sea eagles usually begin to breed at five years of age. But in this case the lake is shallow and productive, ensuring a good food supply. In addition, there is no competition from other breeders. “This combination may explain breeding at this young age,” Halley states. Together with Dr. Torgeir Nygård he is responsible for the NINA part of the programme. The sea-eagle population was also threatened at one time in Norway, but increased as a direct result of legal protection in 1968. Today Norway has the largest breeding population in Western-Europe. 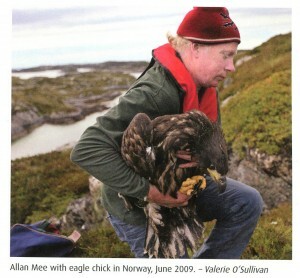 In total one hundred Norwegian white-tailed eagles were released between 2007 and 2011 in Killarney National Park, Co. Kerry. 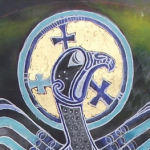 These birds have dispersed throughout Ireland and beyond. To date 21 birds are known to have died. 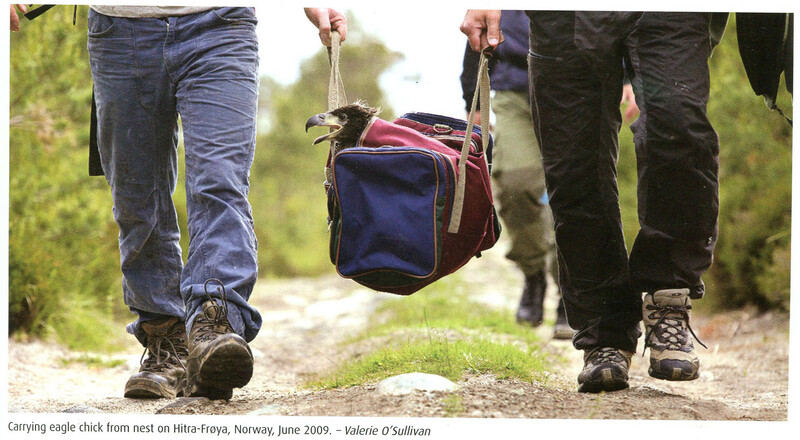 All birds were collected in the Trøndelag area in Norway, one bird only from nests with more than one chick. A time-consuming task, as only 20 percent of the nests have two chicks, or, very rarely, three. “The contribution from the many local volunteer bird enthusiasts has been crucial for the project’s success,” says Halley. In May he and Nygård are flying to Ireland together with some of the volunteers, and with a lot of luck, to observe the hatching. The birds are very sensitive to disturbance, and the brooding period is a critical time. The Golden Eagle Trust have constructed a viewing area onshore with a telescope for close viewing. Information on the birds, their ecology and conservation is also available. Whatever the outcome of this nesting attempt, the signs are good for future breeding in the area. Sea-eagles can live up to 30 years and generally mate for life with adult pairs remaining within their home range throughout the year.